The third and final part of our skills shoot involves the position that is in on every single play and ultimately controls the whole direction of the game, the pitcher. For the pitcher’s portion of the recruiting video skills shoot, two cameras are utilized. The first camera is located in profile of the pitcher. The reason for this is almost solely to show the pitcher’s form and technique. The balance through all of the pitcher’s motions is also very important. The key is to be able to capture the pitcher’s ability to control his body to the plate and to show his sound mechanics in the process. The second camera is placed directly behind the pitcher and elevated around 10 feet off the ground. Our All Star Video Sports videographer will work this camera on company owned scaffolding. The advantage of using the scaffolding is that this angle is similar to the camera angle we’re used to seeing on nationally broadcast TV games. In a real game, the camera is shooting from a high position in center field. But since we control the skills shoot field, we simply elevate the camera on scaffolding so it’s much closer to the pitcher and shows even more detail about the pitcher’s throwing motion. But most importantly, it shows the movement of a pitcher’s fastball, breaking pitch, and off-speed pitch. 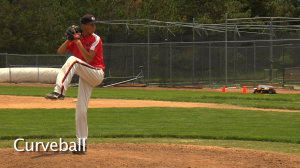 With both cameras, we collect multiple shots of each pitcher’s various pitches from both the stretch and the wind up. 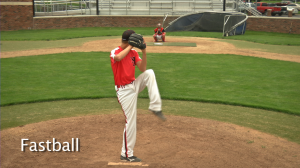 If a pitcher has a good pickoff move, we’ll capture that and include it in his recruiting video also. Coaches do not just want to see technique and accuracy, but a pitcher’s versatility as well. “How confidently and consistently can this player rotate through their pitches?” is something we hear from coaches often. A college coach has to be very confident of their pitching prospects’ wide range of ability before making a decision to offer a scholarship. The multiple shots and angles of form, technique, body balance, ball control, and pitch accuracy are able to provide a coach nearly everything he needs to make that decision.